For the headoffice of the Rabobank in Eindhoven, The Netherlands, Dennebos Flooring supplied a FSC certified engineered wooden floor fulfilling the restriction to fit into the BREEAM excellent guidelines. The interior design company working on the complete interior of this huge office suggested the G.06 for various areas like the restaurant and teaching areas. 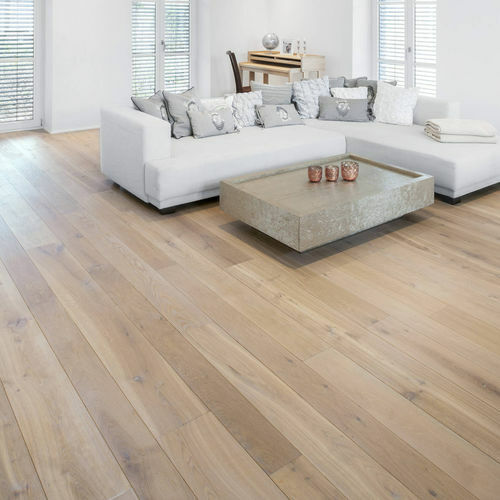 For this project Dennebos Flooring delivered a FSC 100% product by taking a FSC certified Birch ply as backing with a FSC Oak wearlayer of 5,5 mm to have a long term solution. For this clothing shop in Hillegom, The Netherlands, Dennebos Flooring delivered an engineered Chevron Oak floor in a prime grade. Requested dimension was 120 x 600 mm with a 60 degrees angle. The floor, it's grading and the color adds value to the shop and creates an astonishing warm and welcome feeling. Chevron flooring facing a revival. Chevron flooring facing a revival.